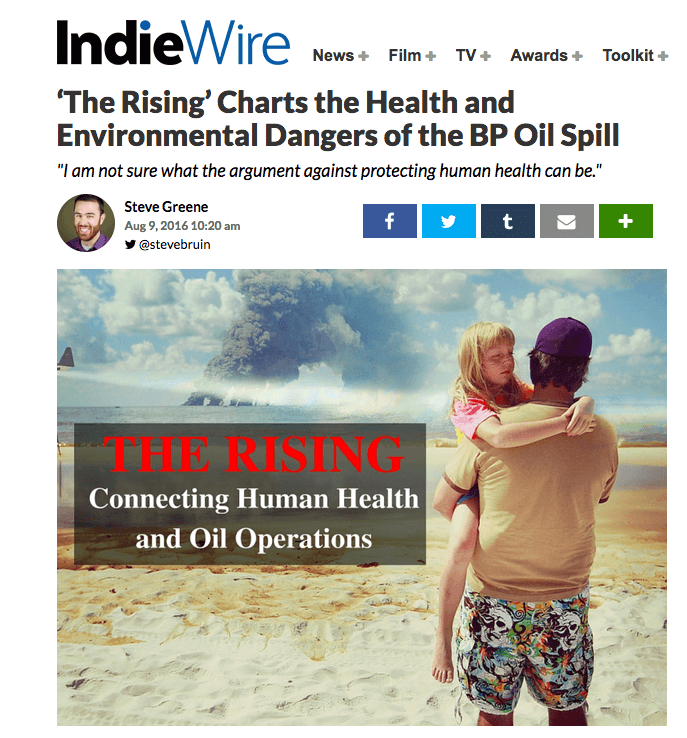 Logline: Hundreds of thousands of people were exposed to the risk of chemical illness when the U.S. government and BP sprayed millions of gallons of toxic dispersants in the BP Horizon Disaster ‘clean-up’ operations. An acclaimed filmmaker turns his lens to the frontlines of the BP Horizon disaster and the large scale cover-up of the tragic health effects following the infamous spill in 2010, in an upcoming documentary called “The Rising.” The film exposes the true health effects for tens of thousands of people and the ramifications of unregulated corporate power and government collusion to our nation. This story is pressing as, remarkably, the toxic chemicals used in the oil spill are presently cleared for use all over the world, exposing hundreds of millions of people to an imminent and severe health risk.